The sun is barely up, but Lucky 7 Teahouse is already bustling. There is a line of waiters running between narrow aisles taking orders, dishing up plates and wiping down surfaces as tables are filled mere moments after they are vacated. We sit on the patio in the dusty heat, nursing cup after cup of surprisingly addictive Burmese tea, a strong black concoction sweetened with a mixture of evaporated and condensed milk. 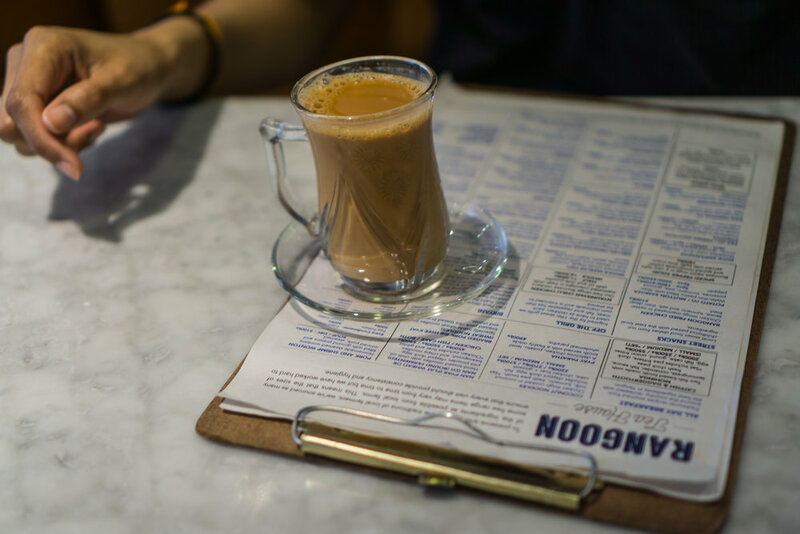 It is the perfect accompaniment to tea house food—curry puffs, wrapped in flaky pastry that would put a French patisserie to shame, crispy samosa salad, drowning in bright, turmeric-yellow potato curry, and mohinga, a fish soup layered with spices and served with vermicelli noodles that calls to mind a Malaysian laksa. As I drop a piece of buttery soft paratha into spicy, fork-tender mutton curry and push it into my mouth, I am convinced I have reached the zenith of my happiness. All joy has conflated into this one moment, in a corner of a heaving teahouse, in the morning heat of a country that only opened it’s borders to the outside world six short years ago. Is this the Nirvana that the Buddha spoke of, I wonder? And did he too find it here, in Myanmar, when he came here in the 5th century? At the next table are a father and son. The boy tells us his name is Troy. “That’s a very American name,” I laugh. Chinese people are one of several minorities living in Myanmar, and these minorities aren’t always assimilated, or welcome. Myanmar has a long, bloody history of civil war, foreign occupation and military dictatorship. Ethnic cleansing is still happening in parts of Myanmar, and tourists are not allowed free travel in the country as yet. Taking all this into account, Yangon (called Rangoon during British Occupation) is still is probably the most multi-cultural city we’ve been to, living in unique harmony. 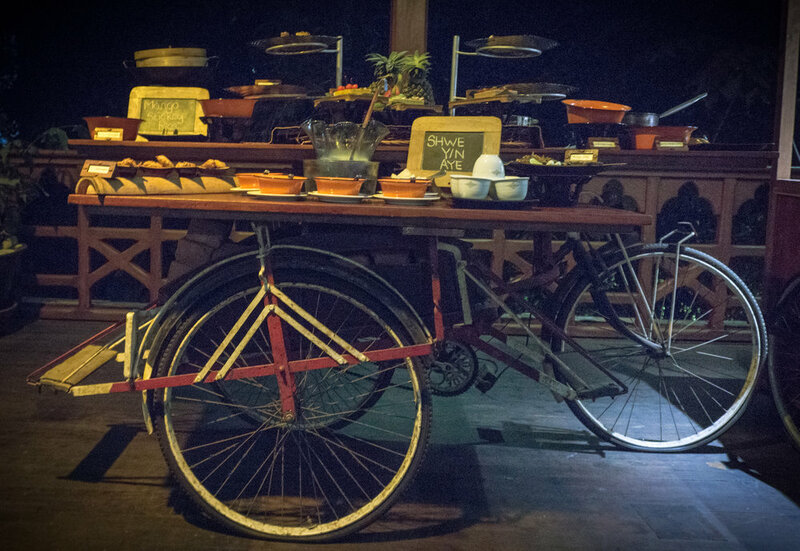 As you walk down the street, you see people of Bamar, Rakhine, Chinese or Indian descent all drinking their chai and eating their samosas on their way to work. Myanmar is not, as many people believe, Communist. It is technically a democracy, but the military still controls the strings of power. They were not overthrown, but rather conceded to a democratic election, and one of their conditions is majority representation in the government, which effectively means that decisions cannot be made without military consent. And yet despite all this, change has come to Myanmar, and we find ourselves next to Troy, who chose his name from YouTube commentors. “So you like YouTube?” we ask. His face lights up. He loves YouTube. He learnt English watching YouTube videos. Actually, what Troy really loves is video games, and his favorite game is Resident Evil. “But I cannot play it, so I just watch videos of people playing it,” he says enthusiastically. He says it so casually, but it brings home the impact of political life in Myanmar. Here are a people who cannot leave their own country freely. It is a nation where everyone over the age of 10 has lived through bloody government massacres, where 20 years ago, asking the wrong question in a university classroom got you sent to work camps and where 15 year old boys watch other people play their favorite video games on YouTube (since they aren’t readily available or affordable). 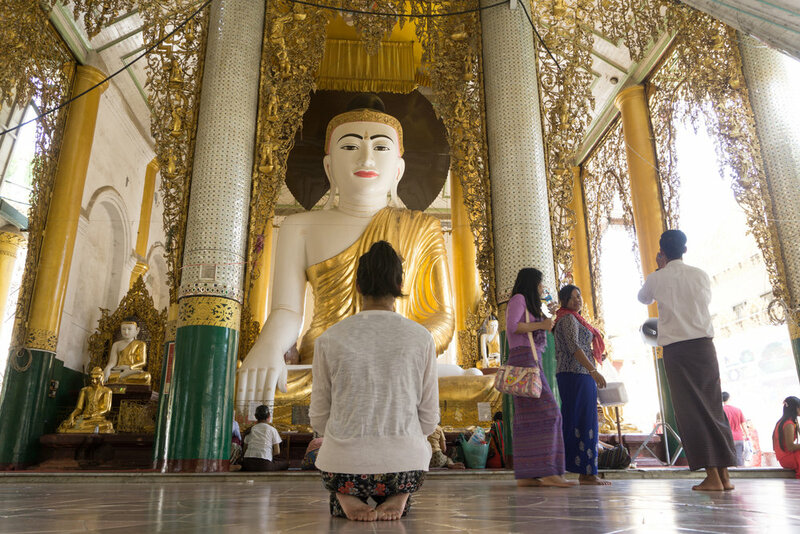 Seen from nearly every vantage point in the city, Yangon’s skyline is dominated by Schwedaggon Pagoda, whose golden dome reflects the sunshine like a beacon calling to its worshippers. We pay the (foreigners only) entry fee to the vast, marble compound, which is like Buddhist Disneyland. Here, Buddha is captured in every pose. He is fat, emaciated, smiling, stern, cast in marble, plaster and jade. But the Pagoda is not some silent, austere home of the Gods. Instead, it’s a bustling community centre, a vibrant, beating heart of the city. It’s Sunday, and everywhere there are local people reading, opening boxes of food to share lunch with their family, taking a nap in a shady corner, playing card games and of course, praying. 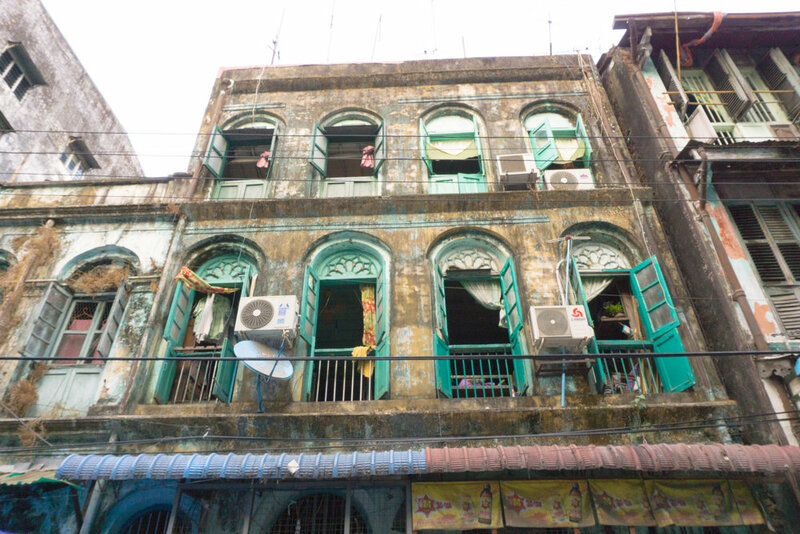 It is a snapshot of life in the capital city, and leaves us feeling like we’ve spent time in Yangon’s living room. 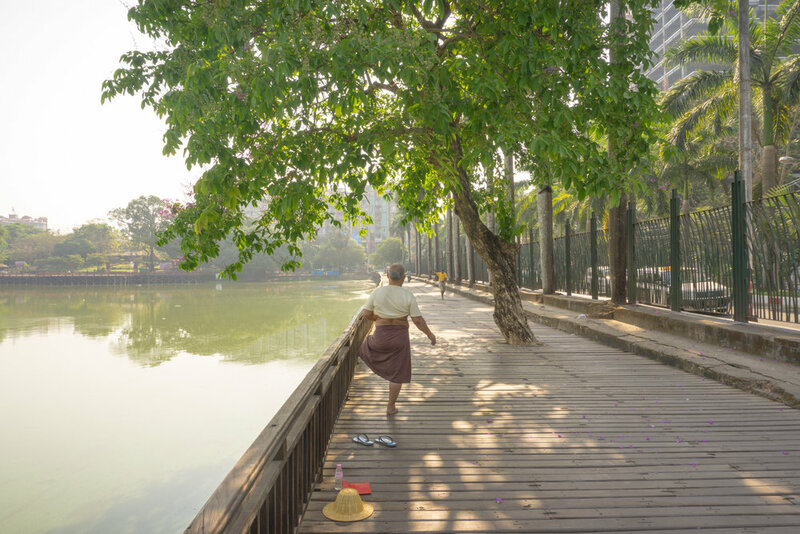 Yangon’s circular rail is a 25.9 mile loop, completed by the British in 1954 to connect the city to the outlying suburbs. 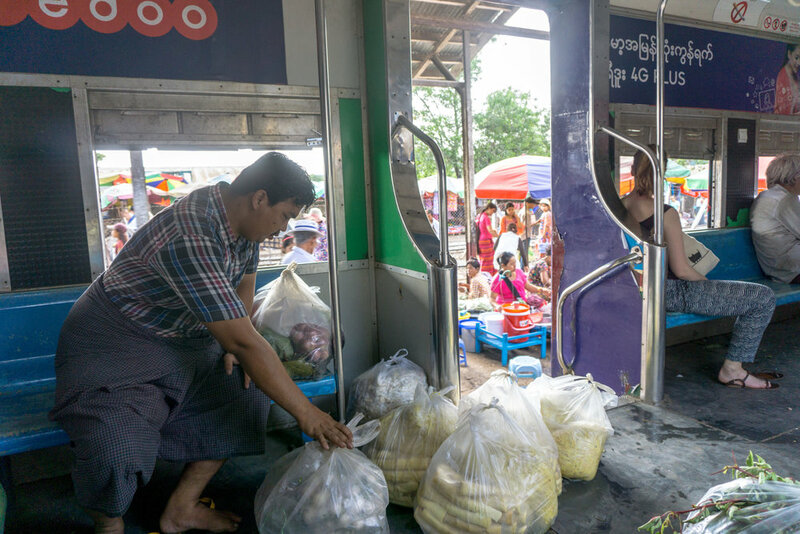 It is used as a commuter train for the lower and middle class, and now, by tourists as way to leave Yangon and see how the surrounding suburbs live. As the city melts away, vistas of sprawling farms, rice paddies and playing children open up . Vendors walk up and down the train selling everything from plastic water guns to fried treats, and of course chai. They call out in a singsong as they walk past, and we watch interestedly as a betel nut seller expertly rolls and packs his leaves, never losing his footing or his efficiency as the train rolls and lurches. Somewhere along the way, we are joined by farmers who load up the train with their fresh produce from the fields to sell in the city. The carriage is filled with bags of fruit, dead chickens, and sacks of grain. 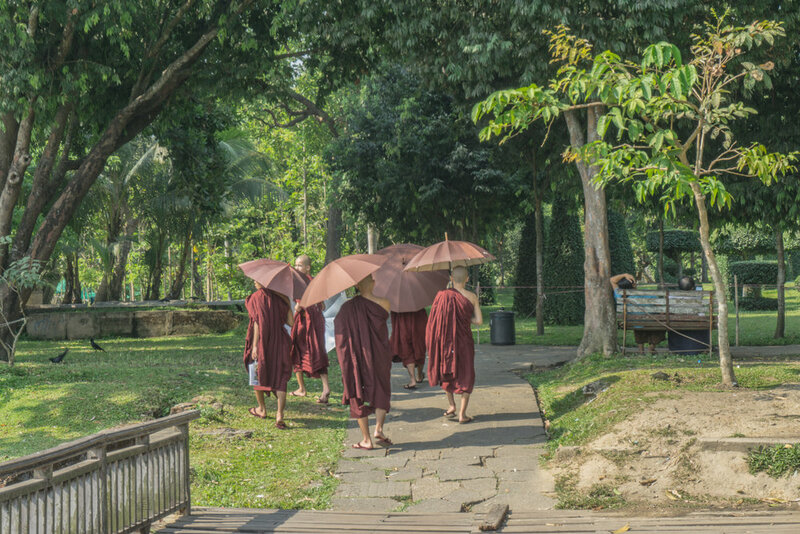 For about one dollar, the three hour loop gives you a real feeling for Yangon. On our last night, we go to the magnificent Belmond Hotel for dinner. Eating at the BBQs on 19th Street was delicious, loud and chaotic, and this is the other end of the spectrum. 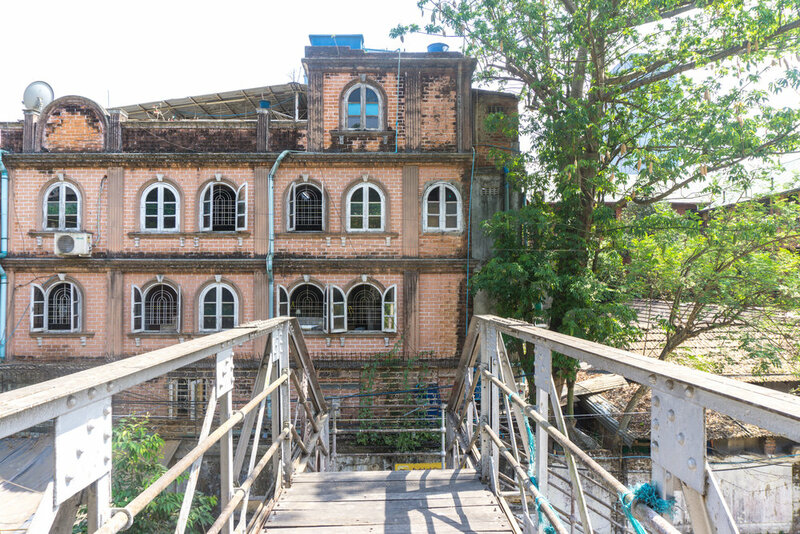 Once the Governor’s Residence, the building has been converted into a hotel and restaurant, and like much of Myanmar, remains a perfectly preserved slice of history. Wooden floors, sweeping curved staircases, vaulted ceilings held up by carved pillars—it is both a lesson in colonial architecture and a testament to the opulence of Myanmar’s occupiers, who provided the country with it’s greatest period of economic growth, built it’s still-vital rail networks, created political stability and economic security while simultaneously creating a serfdom of the local population. It is a tension that many former Colonies still wrestle with. 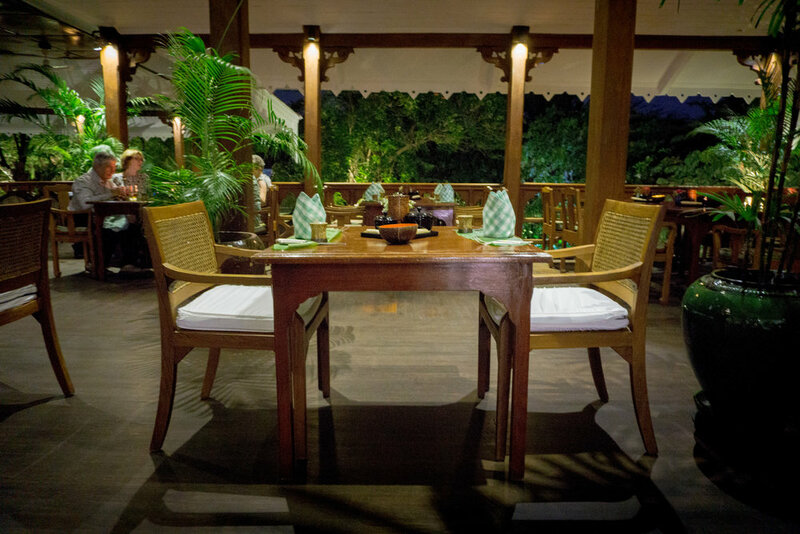 At the Belmond, each table has hand-rolled Myanmar cigarettes and cigars on the table. The restaurant is on the verandah, and we smoke overlooking the wrap-around pool. The food is a selection of local dishes which our server Winter tells us is typical of what they eat at home, but, she adds, with less oil and chili for the foreigners. We ask her about life in this extraordinary place, where modernity is crashing head-first with a country that has closed itself off from the world for the last half century, where democracy exists alongside a military junta, where people have freedom around dating and relationships but still fear to speak out against their government, where foreigners have started pouring in but locals cannot leave, where washing machines and refrigerators simply don't exist in the whole country. Winter tells us about her ex, who left her for another woman (“He left me and I was broken here,” she says, pointing to her heart, her stilted English inadvertently poetic.) Her dream is to join a cruise line, so she can see the world. The place she wants to go most? Canada. I will never again smell lavender without thinking about that warm summer evening in Myanmar, and Winter’s face as she talked about a flower that doesn’t grow in the homeland that she can’t leave.